If your vehicle has been significantly damaged during an accident or you have driven it for a while, and it’s experiencing wear and tear, chances are, you will need to purchase replacement parts. You might think that doing so is simple: Your repair shop handles everything, anyway. But the type of parts that your vehicle will be repaired with can vary – and your car insurance will often dictate the type of parts you can use if you want the repair to be covered. In most cases, both types of parts are options for repairing your vehicle after an accident. You have to choose as to what kind of parts are used to repair your car. Both types of parts are good options, but which kind is the best? What are the differences between OEM parts and aftermarket parts? Does it matter what kind of parts are used to repair your vehicle? It pays to find out a little more about the auto parts used to repair vehicles before getting your car fixed. What are the differences between OEM parts and aftermarket parts? OEM Parts: OEM is an abbreviation for Original Equipment Manufacturer. It means the parts are made directly by the car manufacturer, not by a third party. OEM parts, because they are made by the manufacturer to fit the specifications of a particular make and model, tend to fit perfectly. However, the also cost more money as a result. After Market Parts: Aftermarket parts are manufactured by a company other than your car manufacturer. They can be produced at a high volume and made to fit the specifications of different types of vehicles, not just a single car make and model. They are similar to OEM parts in like, kind, and quality, but they may not be a perfect fit because they are made by a third party. As you can imagine, they are often also much cheaper. Which parts are the best? It is easy to guess OEM parts are the better parts because they come straight from your car's manufacturer. But are they always the best parts for you? It comes down to personal preference. People that are usually very concerned about getting OEM parts include car enthusiasts, body shop repairmen, or owners of a brand new vehicle. The rest of us tend to not know the difference or care; we just want our truck fixed. The lower cost of aftermarket parts make them a very appealing option and often the best option. Does it matter what kind of parts are used to repair your vehicle? To some people, it most definitely matters. OEM parts keep the vehicle closer to its original state. However, on the flip side, once you drive your car off of the lot, it is no longer new. 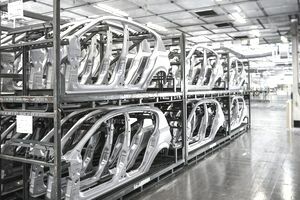 So why do you need OEM parts when used parts or aftermarket parts can get the job done in a more cost-effective manner? But, that advice is coming from someone who is not a car enthusiast, body shop repairman, or owner of a new vehicle. It is up to you whether the kind of parts used to repair your vehicle matters. Will insurance cover OEM parts for repairs on my vehicle? It all depends on your specific policy. Most insurers will only cover aftermarket parts because they accomplish the same job for less money than OEM parts. You should check with your insurance agent -- and if it is important to you that OEM parts will be covered, you should look for a policy that covers them. Will the parts used for repairs affect the future resale value of my vehicle? A vehicle damaged in an accident could be valued lower than one that was never damaged, primarily if there was structural damage or airbag deployment. However, the parts used to make the repair probably will not have much of a bearing on your vehicle's resale value. Going with OEM vs. aftermarket parts will only be for your benefit and peace of mind. Weigh the cost against the potential difference, which is small, to help you decide which parts are the best for you and your family. Should You Repair Your Car With Aftermarket Parts? Can Paying Car Insurance Damages Out of Pocket Save Money?